Originally from Victoria, Andrea holds a BA (Hons) in Political Science from Dalhousie, and an MA in International Affairs from Carleton (NPSIA,) with previous studies in English Literature and Classics. Her MA thesis tested a theory of differential mobilization into non-Islamic terrorism, while her undergraduate thesis explored civil-military tension in the Auditor General’s review of defence procurement in Canada. 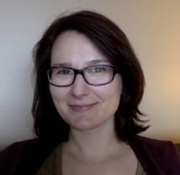 Andrea’s research interests include maritime security, military cultures, civil-military relations, defence policy and procurement, gender in security, and Canadian foreign policy. Her dissertation focusses on the impact of service-level cultures on procurement decision-making. Briefly a member of the Royal Naval reserves, Andrea sings soprano with the Halifax Camerata Singers, and enjoys using dog shows and camping trips as excuses to not answer emails on the weekend. She tweets at @ap_lane.